That was great Gremlin, thanks! Absolutely cannot wait for the 16th. Okay this guide is going to be very specific to how I prefer my set up, but I'm going to try to divide it into control groups roughly in order of priority to give you a structure to think about as you set up your own joysticks. First thing I would suggest for a pure CH setup is to use CH Control Manager to combine all the devices into one virtual device. They fixed, apparently, most of the bugs with using more than one control device, but I find it easier just to use the control manager for everything and not worry so much about the in-game set up. That's also why I use the keyboard mappings rather than trying to set everything up as joystick buttons. Plus, if the in game bindings get changed I can still go back to the control manager and reset everything. That will probably less of a consideration after release, but during the Gamma it came up several times. The most important controls obviously are the axises. I'm not gonna give you a whole lot advice on setting those up, since that's probably the most personal choice you are going to be making. For the CH Fighterstick/CH Throttle, you've got six analog axises to work with. I have the stick's X set to roll, Y set to pitch, and the throttle's ministick's X on yaw. There are many, many other possible ways to configure yaw and roll. Pick which works best for you. I will mention that you may want to map the yaw/roll toggle button. The throttle is, of course, bound to the throttle axis. You can set it to full or half, I have mine set to forward half with a button to toggle reverse throttle, because the CH throttle doesn't have an obvious zero point in the middle. If you do want to use it with full throttle, Elite has a setting for a dead zone that you probably want to use. The next set of controls are the lateral thrusters. You going to get a lot of use out of these in docking and combat maneuvers, so they should probably fairly accessible. You'll need six of them, one for each direction. I have up, down, left, and right on one hat switch, and forward and back on the ministick Y axis. Many people seem to like using the ministick for analog lateral thruster control. Again, there are lots of different configurations that will work fine, though I do recommend having them split between two hands so that you can control all six without repositioning your fingers. If you're using a joystick with fewer buttons, you probably get away with having these on the keyboard. But I do like the convenience of having all of it on my stick. Third most important group is the power allocation. This is not very important if you're just getting from point A to point B. But it's vital in combat. I have mine bound to hat switch, ordered to mimic the display on the interface. Balance power is down, power to systems, engines, and weapons in clockwise order. Targeting has a whole bunch of functions, and it's pretty much up to you which ones you want to emphasize. 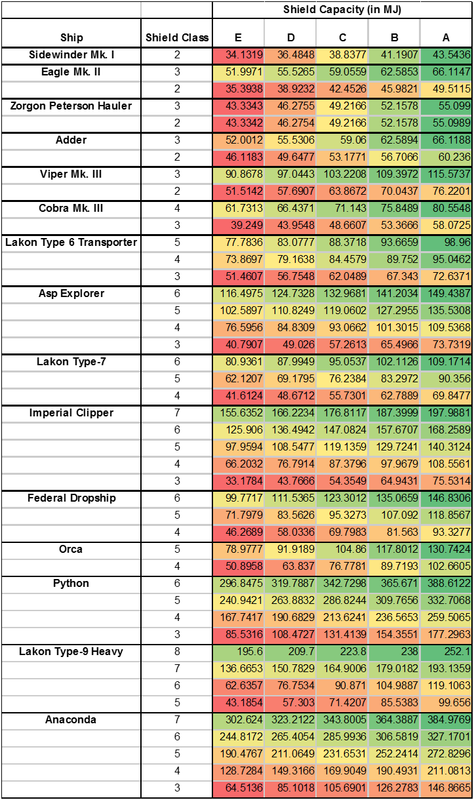 Select target ahead is probably the most important, followed by select next ship, cycle next hostile ship, select highest threat, and cycle next subsystem. Plus the cycle previous buttons for each. It's probably a good idea to have them easily accessible for combat, but so far the ones I've gotten the most use of are target ahead and cycle next ship. The last group I'd look at are the FSD and engine controls, which for most practical terms can be reduced to the engine boost, and the frameshift drive. The FSD can technically be in either supercruise or hyper jump mode but in the majority of cases the unified FSD button will use the context of the currently selected target to understand which one you want. The rest of the controls are less easy to put into well organized groups, at least to my way of thinking. I have used the shift function to put a bunch of the less used, or more dangerous, commands in slightly hard-to-reach places. Shifted balance power allocation, a.k.a. shift plus the down arrow, is the landing gear. You can set up a separate control scheme to automatically take over when you're in landing mode. I haven't bothered, because I've already got enough access to lateral control. But if you want full analog axis control, the option's there to use your primary stick. Shifted power to weapons, a.k.a. shift plus the right arrow, is the deploy hard points button. I would recommend, especially when you're starting out, that you turn off the automatic deployments on primary trigger. The ship's weapons start out stowed by default, and with the option on they automatically deploy when you pull the trigger. The catch being it's way too easy to accidentally pull the trigger in the excitement of scraping past an incoming ship in the docking bay. I prefer to have an extra layer to act as a safety on the weapons. This would probably be a good time to mention the firing groups, which while not technically a part of the control layout, are kind of connected. The firing groups are set up in the right side systems panel, and let you assign each weapon or active device on the ship to either the primary or secondary trigger. You can cycle between the firing groups with the next fire group button. Note that these are not just weapons. For my trading hauler, one of the firing groups has the discovery scanner on primary and the heatsink launcher on secondary. You should probably also set up a control for the cargo scoop, the chaff, the shield cell, the ship's lights, deploying a heatsink, and silent running. But they're not stuff you're going to encounter on your first run. Get the rest of the map set up the way you want it and test it before you bother to mess around with them. A button for headlook is useful depending on what other gear you're using. I have the headlook toggle in one of the buttons on the front of the throttle, and use the ministick to control headlook. This hides the other functions on the ministick until I toggle it back off. Last thing I'm going to mention, because I haven't finished messing with it myself, is Flight Assistance Off mode. FAOFF lets you travel in one direction while you're facing another, and opens up a whole slew of maneuvers that you can only pull off in a spaceship. But it also disables the automatic course correction from the thrusters, so it takes a little bit of practice. I definitely have not mastered it yet. But you'll probably want to set one of your buttons to control FAON/FAOFF. Finally, make sure that your joystick is plugged in, or the CH control manager was activated or whatever you need to do for your device before you start the game. If it doesn't detect your joystick, it won't load the control layout. You get it back by closing the game and restarting it after your joystick is plugged in so it's not gone just not selected or visible anymore. I'll see if I can't end up near I Bootis on Tuesday. Hopefully I'll have earnred enough to get a decently equipped Cobra by then. So I've been pretty much on media blackout about this game, but now that it's about to launch and I'm considering picking it up it's time to make sure of the one thing I HAVE been hearing about here and there - controls. I don't own a HOTAS, and am very unlikely to get one. Is it a (practical) must for this game, or are M&K/Xbox controller for PC viable alternatives? While a HOTAS is probably the most immersive method of control, I use a gamepad along with Voice Attack and have no issues at all, and never need to use the keyboard. I guess how proficient you are with a gamepad will dictate whether M&K would be a better alternative than gamepad, but both are very viable. Yeah, don't take my intimidating wall of text as suggesting that a HOTAS is required. There are actually a few options in the control settings that you might want to check out even if you're just using mouse & keyboard, that might make it easier to customize to the way you prefer. After watching a few of the pilot training videos linked above, I doubt I have the willpower to resist. So is there some sort of GWJ guild/clan/trading group or whatever they called it here? Thinking about this today I think the reason I prefer mouse to stick is that once you initiate a roll/turn with the mouse and stop moving it, you hold that roll/turn with no further input. To do the same thing with the stick you need to hold the stick in that position for as long as you're holding the manoeuvre. I find the more precise control that gives me makes it easier to hold a line on someone's tail, shake an interdiction attempt, match rotation on a space station docking port, or orbit a star at 0.3c just outside the mass lock line to fill the fuel tanks. Does anyone with Voice Attack use this: http://www.elitedangerousvoicepack.com/? It looks awesome, but I'm worried that my mumbled Southern speak would result in a lot of misunderstood commands! I don't use it, but it looks neat. Voice attack just uses the in-built Windows voice recognition software - all VA does is map the voice command to a keypress or sequence. I think I had to run through the Windows voice software 3 or 4 times until it 'learned' my voice. The thing is, it doesn't have to know the word you are saying, just as long as you say it the same way each time. Even if it picks the word up wrongly, you can still map that 'sound' to whatever keypress you want. I've been using it; it works with the basic Voice Attack voice recognition, so as long as that can understand you, you should be fine. (Use the Windows voice recognition training if you want to increase its accuracy.) You can install Voice Attack in trial mode if you want to test it first. OK, so I dug out my HOTAS X (another thanks to Gremlin for the write up) and man if that combat demo alone isn't a ton fun. Voice Attack is already really tempting me and this'll probably be the game that sells me an Oculus. I'm thinking I might sell the stick I bought and put the proceeds towards TrackIR. Cos, seriously, that's the killer peripheral for this game. edit: Apart from an Oculus, obv. Not to beat the same drum all over, but EDTracker is a very good alternative to TrackIR, and now it has Opentrack support, it works in any game that supports TrackIR. The only thing missing is the forward/back degree of freedom. I'm a little sorry I ponied up the $75 for beta. I probably should have done some more reading but this game probably isn't what I was looking for. I thought there would be a more robust co-op element and combat to it. Seems more like a space-trucking sim, albeit a gorgeous one. Here's hoping the continued development will prove me wrong, and it's certainly a hell of a lot better than Star Citizen at this point. They are light on the co-op for sure, with announced plans to add additional co-op features in January. Not sure what you mean about the combat part... there's tons of combat in this game. What controls you are used to is important. I cut my teeth on flight sims with an old Atari style joystick, and then graduated to a HOTAS, which I used for hundreds of hours. At this point, that's burned in; for me, mouse and keyboard is for arcade flight, nothing else feels right using one. When I do anything like a serious sim, I have to be HOTAS, preferably with foot pedals too. Play to your strengths, especially if they save you monies. I am going to spend some time once there are no wipes, it is a bloody gorgeous game. Do you vets, have some tips for someone who is just starting out, like once I do all of the training missions? There are already no more wipes. Announced a couple of weeks ago that the last one has been and gone. Ah, I didn't notice that they were selling them prebuilt with enclosures now. I didn't get one because if it required a project it'd never get done. OK, that's totally affordable. Bought! You'll start in a Sidewinder. If you've played in the beta, you're probably already aware that it's basically a jack of all trades. First thing you want to upgrade is the FSD so you can do hyperjumps longer than the starting 6ly. Second thing you'll want to do is to upgrade the cargo hold so you can carry more than 4 tons. That opens up all of those missions that want you to take 5 tons of something somewhere. To do either of those things, you're going to need cash. Missions were the easiest way to get cash at first when I started. You may or may not have trouble finding ones you can do. If you do, they tend to pay out roughly twice what just hauling that cargo would have, plus you get a reputation boost with the faction who owns the station. Raise your reputation enough, and they'll give you some of those missions that have been taunting you at the bottom of the bulletin board. Trading is currently being adjusted (they think the NPC traders were going overboard) but if you can find a station that it selling a commodity at significantly less than the galactic average, buy it and start shopping around for a buying system. Might take a couple of hops, but if you bought low enough you'll make a profit. 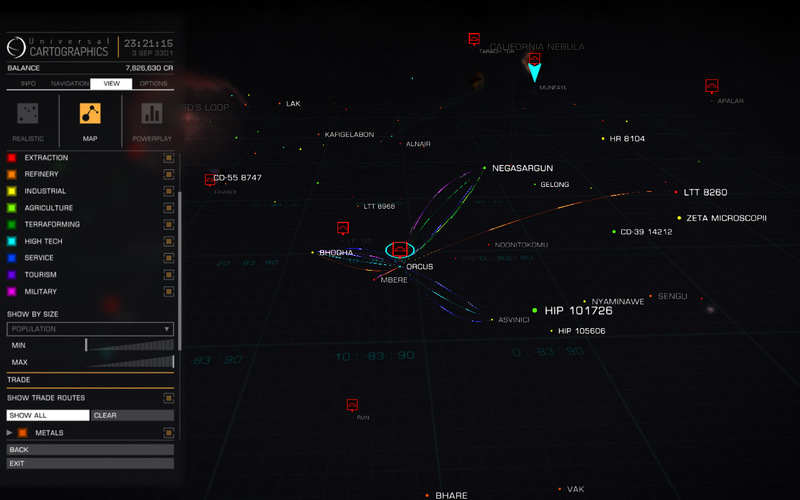 Do use your discovery scanner to explore each system you jump through, you can easily pick up a couple thousand extra credits that way without spending too much time on it. Turn the data in at Universal Cartography on the station. Combat is, I think, viable in a Sidewinder (though if you have an Eagle, switch to that) but I haven't been in enough fights to really give you much advice on that. I personally like the space trucking part, so I'm a bit biased. But my next ship is going to be a bit more combat worthy. There are lots of combat missions on the bulletin boards now, so I'm guessing that's going to be a viable income stream. As for co-op, I haven't tried to meet up with anyone yet, so I don't know if the instancing has been improved. If you're looking to hunt down player ships, every station has a list of the top 5 player bounties and where they were last seen, and I hear that bounty hunting in general can be lucrative. Hey, what exactly are these enclosures? Lots of connection problems tonight, in both open play and solo. I think their servers are especially unstable right now for some reason. I had a really awesome close call tonight. I was on a long voyage hauling rare goods when I jumped into a new system at a far greater-than-normal distance from the star. It took me seconds to realize that was because the star was a huge blue giant, far bigger than most of the other stars. Those seconds were also long enough to push my heat to dangerous levels, and it took some quick thinking to drop out of supercruise and deploy a heatsink. When I finally escaped, I limped away from the next star with zero heatsinks left and hull down to 70% from the heat stress. Is this the prebuilt device people have been purchasing? I use it. It makes it through my Texas drawl with nary a hitch. It's a nice addition to voice attack, but absolutely unnecessary. "Time which you enjoyed wasting was not wasted"
I've got a decent Voice Attack profile that I've been working on and slowly adding stuff to over the past couple months, if anyone would like a copy of it, I can put it up on Google drive and share with anyone who wants it. I've probably got roughly.... 50-60 commands set up, some with audio cues. If you'd like to try it, just PM me an e-mail that has a Google account attached to it, and I'll share the info with you. I'll just have to clean it up a little and upload it over the next couple days. Best part is, doesn't cost you any money! That's the one I bought, yes. DO: Start with missions to get some seed cash happening as you won't have enough cash to fill your cargo hold at the start. DON'T: Pick up missions that require you to return with X tonnes of a particular cargo unless you know exactly where to find it. I strongly recommend only doing outbound delivery missions while you're starting out. DO: Stack missions where available to deliver to the same port in the same system. DON'T: Stack missions to multiple ports in a neighbouring system. Ports can be a looong way from each other and it often takes quite a bit longer to supercruise around in-system doing all your drop offs than it does to complete your mission and pick up a new one. Supercruising around also exposes you to the risk of interdiction which will lose you your ship, your cargo, and your mission. DO: Fill up spare cargo space with stuff your mission destination will buy so you can turn a little extra profit. I used http://www.elitetradingtool.co.uk/ to help plot out trades through the beta. It's been under constant development but I'm not sure it's much use now the galaxy is much, much bigger. Also using that tool prevented me from learning good trading practices on my own which is a skill you definitely need in the big bad galaxy. Maybe use it to get you started but don't rely on it like I did. DON'T: Perform any substantive upgrades on your starting Sidewinder. I disagree with Gremlin here. Firstly, you can easily make enough money to get a Hauler or an Eagle or whatever other upgrade you're shooting for doing short range hauling. Any money you spend on your Sidey just means it's going to take longer to get that upgrade. Secondly, any upgrade you make to your Sidewinder you're going to lose when you smash into the station gates, or get shot by security services because you forgot to request docking clearance, or confuse your Boost button for your Landing Gear button, or any number of the dozens of other things you do that are going to lose you your ship during your first couple of days of play. Thirdly, you need as much money as you can to finance high value trades and if you keep raising your insurance premiums by upgrading your free sidewinder you'll be stuck in it for ages. DO: Perform cheap upgrades that allow you to haul more cargo. As of the last reset I'd stripped the system scanner and shields from my sidewinder and replaced them with cargo racks; then stripped out the guns to improve my operational range. Ended up with a cargo space of 10 and a nippy little ship that could turn over a 20k round-trip profit in a matter of minutes. I didn't even bother upgrading to a Hauler last time, I just used my blockade-running Sidewinder to trade my way all the way to a Cobra. DO: Try out combat and exploration in your free Sidewinder (without upgrading) to get a feel for what other route you might want to go when you upgrade. Personally I'd recommend just sinking every available penny into getting to a Cobra as soon as possible as they really are the workhorse of Elite and capable of being loaded out for just about anything.